Posted on Monday, June 20th, 2016 at 2:21 pm. Today is the first day of my favorite season. Happy summer to all! With any new season I think it’s important to write a list of things to accomplish, so without further ado here’s my bucket list for the summer. Bike through the Vineyards. There are so many places you can go on your bicycle! Hop on and ride from winery to winery and enjoy the beautiful views that Livermore Valley has to offer. For all of the local bike paths, click here. Taste Our Terroir. This is four days of wine and food from your favorite wineries and restaurants. The line up couldn’t be better this year with a lobster feed, progressive dinner, brunch in the vineyards, wine seminars and so much more. Click here for the full list of activities. Attend one event or multiple for a full weekend of delectable fun. Picnic in the Vineyards. You don’t have to get down in the dirt to enjoy a picnic. Many of the wineries have great spots to picnic. Find a full list here. Garden Trail. Did you know that there is a Drought Resistant Garden Trail throughout Livermore Valley? Check out this map and view beautiful gardens. You can even stop in at some of the wineries and sip while you commune with nature. Harvest Wine Celebration. Sadly, the end of summer, but celebrate the change in seasons and the newest harvest of wine grapes. Over 25 wineries will be participating in this two-day event. This is also the 35th Harvest Wine Celebration so expect the weekend to be better than ever. Click here for tickets and details. Try a new winery. We all have our favorites and it is so easy to just keep going back to them. This summer, branch out and try a new winery or two before heading to your old favorites. You may notice that your favorite winery list will get longer and longer. For a full list of wineries, click here. Movie Night in the Vineyards. More than one winery will be hosting movie nights throughout the summer as well as a multitude of other events. Enjoy the summer heat as the sun sets and watch one of your favorite movies. For a full list of winery activities, click here. Ride the Livermore Trolley. 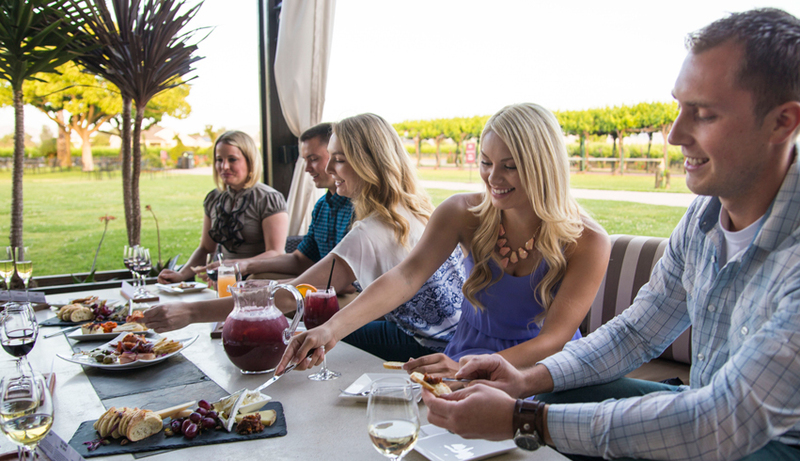 Have you heard that you can hop on and hop off at certain Livermore Valley wineries this summer? This is a great way to get around without having to drive. Don’t want to share your ride? Here’s a full list of our transportation partners. Livermore Airport Open House. Technically, not in summer, but who doesn’t love to make plans ahead of time. Check out the newest hangar at the airport, peruse airplanes, all while sampling some of Livermore Valley’s finest wines. Check back here for more details as the event gets closer, but for now, mark your calendar for October 1st. Try a new restaurant. Oh how I wish we could simply drink wine all day. Unfortunately, we must eat food as well. Try one of these restaurants for some delicious bites before, during or after your wine tastings. As I mentioned before, this is my favorite season. It’s so nice to be outside enjoying the warm weather. Don’t forget to check out the itinerary planner to make your trip as seamless as possible. I look forward to seeing you in wine country this season.